Check out the Melbourne experience of ABBA WORLD through the eyes of some Melbourne fans! 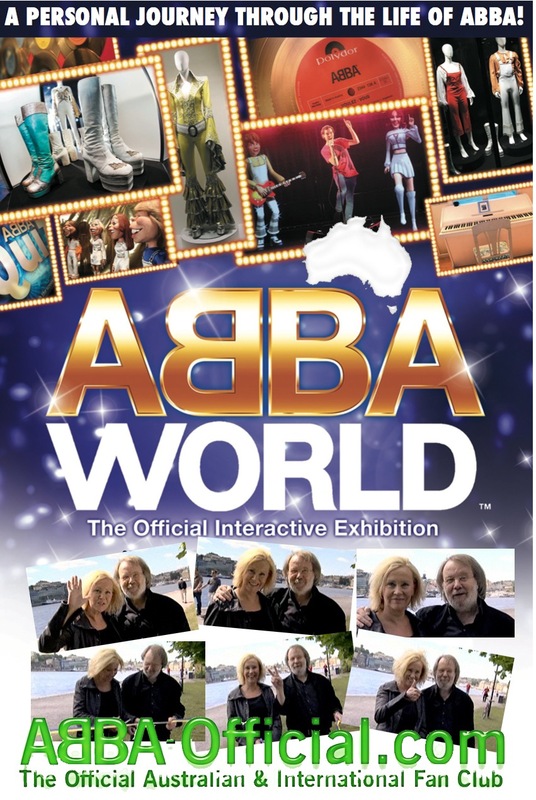 ABBA WORLD MELBOURNE -NOW OPEN! Comments : Comments Off on ABBA WORLD MELBOURNE -NOW OPEN! Agnetha and Benny open ABBAWOLRD OZ! Video footage by abbaworld. all rights reserved. Used for promotional purposes only. Please Do not copy thank you. Comments : Comments Off on Hello Melbourne!- World Exclusive! What a Swede sensation it was. For a few dizzy days in March 1977, four charismatic Scandinavians were the toast of Australia. Thousands of us wanted to see them or be seen with them. And as Benny, Bjorn, Frida and Agnetha criss-crossed the country, singing their humungous hits, there was only one word on everyone’s lips: ABBA. This week, with the opening of Abbaworld at Federation Square, that mad, far away time is vividly recalled through costumes, videos and memorabilia. The monster-sized exhibition – direct from London to Melbourne – is crammed with super-trouper treasures. And some of them relate directly to ABBA’s legendary Australian tour. “It was very profitable for everyone,” promoter Paul Dainty remembers. But the man who brought ABBA Down Under – and is now hosting Abbaworld – got more out of the experience than just money, money, money. “What I learnt from that trip was how to deal with a tour that was an event, not just a tour,” he said. Australia’s love affair with ABBA started in 1975 when three of their songs – I Do, I Do, I Do, I Do, SOS and Mamma Mia! rocketed up the charts. Exposure on Countdown turned the Swedes into stars and by 1976, when they visited Australia to record a ratings-breaking TV special, Dainty sensed a wave of interest was turning into a tsunami. “I met (ABBA band managers) Stig Anderson and Thomas Yohansen and we hit it off straight away and worked out a deal pretty much in that meeting,” he said. The deal was perfectly timed. In early 1977, Australians of all ages were humming Fernando and Dancing Queen and the scene was set for pandemonium on a scale not seen since the Beatles hit town in 1964. “It was almost Beatlemania all over again,” Ian ‘Molly’ Meldrum remembers. Dainty says “it was mayhem. Good mayhem”. The madness began as soon as Abba landed at Tullamarine Airport and climbed into a black Rolls-Royce. The road into the city was lined with fans and thousands swirled around Melbourne Town Hall where they attended a civic reception. Comments : Comments Off on What a Swede sensation it was. NEW YORK – Benny Andersson isn’t surprised that listeners mistake the title track of his recent U.S. release, “Story of a Heart,” for a vintage ABBA song. But the rest of the album, with its roots in Swedish and other European folk music, showcases a side of the pop legend unfamiliar to audiences outside his native Sweden. The 14-track CD, released in March, is mostly comprised of highlights from three albums released in Sweden since 2001 by the 16-piece Benny Andersson Band, including top Swedish vocalists Helen Sjoholm and Tommy Korberg. Andersson’s compositions draw from an eclectic mix of musical styles: traditional Swedish music, 1940s big band swing, classical, early jazz, polkas, waltzes, and ’50s rock ballads. But Andersson wanted one new tune that would get radio play, so he teamed with ABBA song-writing partner, lyricist Bjorn Ulvaeus, to write “Story of a Heart” with its multilayered harmonies and soaring female vocals by Sjoholm. It’s the first ABBA-like pop song the pair have written together since they collaborated on a 1993 album with Swedish singer Josefin Nilsson. But Andersson makes it clear his current band, which includes top Swedish folk and classical musicians, isn’t a pop one. Its members wear street clothes, not outlandish costumes. 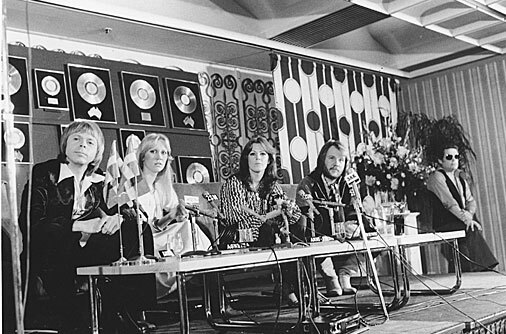 Its recordings are closer to live performances without all the studio effects used by ABBA. Andersson not only plays keyboards, but also his first instrument, accordion, which he rarely touched with ABBA. The band has performed only a handful of concerts outside Sweden, where in the summers they perform at outdoor venues, bringing along their own dance floor. Most of Andersson’s tunes on “Story of a Heart” are instrumentals, such as the supercharged polka “Jehu” and “Trolska” with its traditional Swedish fiddle music. Andersson’s links to the Swedish folk tradition are also reflected in the musical “Kristina,” based on Swedish writer Vilhelm Moberg’s four-novel series, “The Emigrants,” about the struggles of a poor Swedish family trying to build a new life in Minnesota in the mid-19th century. The musical, which ran in Sweden from 1995-99, has recently been translated into English with Andersson and Ulvaeus teaming with lyricist Herbert Kretzmer, who co-wrote “Les Miserables.” The English-language version had its premiere as a concert performance last September at Carnegie Hall. Andersson says the epic-style “Kristina” has more in common with “Les Miz” than with “Mamma Mia!,” the Broadway-turned-film smash based on ABBA’s music. Andersson was initially reluctant to greenlight “Mamma Mia!,” but warmed to its female empowerment theme centered on a mother-daughter relationship. Andersson says the ultimate validation has come from acts such as Madonna, who sampled ABBA’s “Gimme! Gimme! Gimme! (A Man After Midnight)” on her 2005 recording “Hung Up.” In March, ABBA was inducted into the Rock and Roll Hall of Fame. Andersson is always asked if the band is going to reunite. But a reunion is extremely unlikely: “I don’t see anything good coming out of it,” he said. Andersson, 63, is the only ABBA member still publicly performing. Ulvaeus is semiretired but still writing lyrics. Andersson’s ex-wife Anni-Frid “Frida” Lyngstad and Ulvaeus’ former spouse Agnetha Faltskog haven’t made any new solo recordings since 2004. Comments : Comments Off on WHSmith ABBA Magazine. 2011 is turning out to become the ABBA year to remember! 3 calendars and a possible ABBA 2011 Diary to be released. Most years we have had only 1 released, but not even half way through 2010 and already we have 3! Watch this space for more!!!! You can order all 3 2011 ABBA calendar’s from our store. Comments : Comments Off on ABBA 2011 CALENDAR No.3!